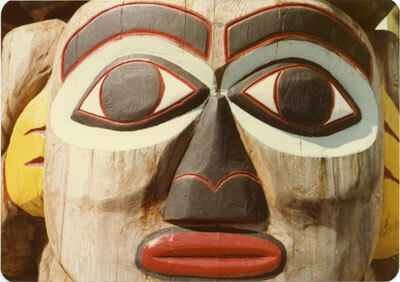 Detail view of face on totem pole at West Vancouver Community Centre. Downloading images from this site is governed by our Guidelines for Appropriate Usage and Conditions of Use. Scanned August 2011 using Epson Perfection V700 Photo at 300dpi and 100% of original image size. Alternate Versions: Lossless TIF from original scan at 300dpi and 100% of original print. W12.5 x H9 cm colour print on photo paper. Negative Available, unknown condition.